Its 7pm and pitch black, the captain, crew and the 8 other travellers are fast asleep.I’m on night watch. It’s down to me to make sure ‘The Victory’ doesn't sail into the path of any other boat (or iceberg). I am hanging out of the side of the sail boat, neck stretched, keeping my eye on the horizon. My eyes can’t stay in one place for long though, there is so much light, but not from other boats. The moon almost leads a path for the Victory to stay on track, reflecting its glare onto the rough ocean waves. In competition are the plankton bursting with sparkle every time the boat hits the water, and then the stars, who seem to have multiplied since we left shore, look upon the whole journey with silent power. I realize my eyes are nothing when it comes to nature. So I sit back a bit and relax. The boat is swaying from left to right in a perfect motion, the sail creates a soothing sound as it picks up the wind and the stars are performing acrobats above. I take in the moment and almost cry with joy that the pacific ocean has decided to be nice to us tonight, and not chew us up and spit us out like it did just a few days ago. 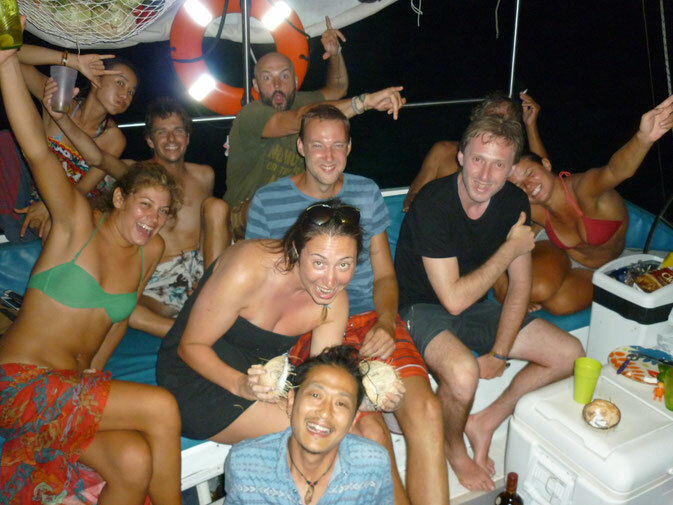 The best, worst, experience of my life… Illegally crossing the ocean from Colombia to Panama on a sail boat. The decision to take the boat was a pretty easy one. 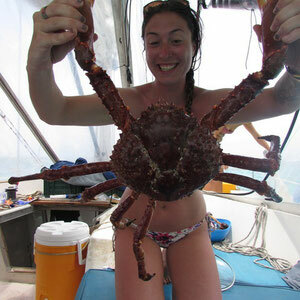 $500 for 6 days on a boat, 3 days in the paradise islands of San Blas, 3 meals a day, and a bed (?) to sleep in VS a flight that costs $350 (OR crossing the Dariens Gap through foot which many have never come out the other side). 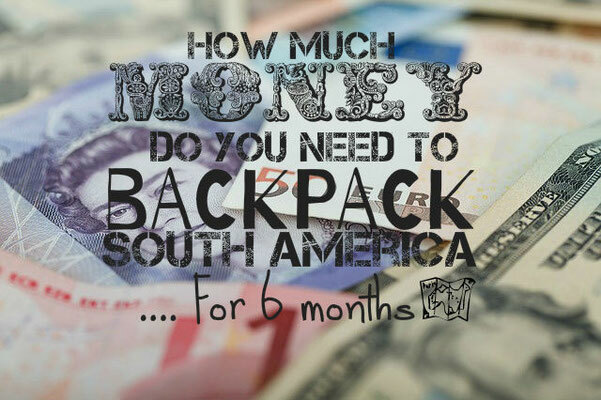 Id heard about it through the backpacker trail in South America, yet I’d never met anyone that had done it. I hadn’t done much research as there wasn’t much you can do. You chose a tour company to go with (they all charge the same price) and they take you to Panama. What I didn’t realize were there were different types of boats, again all the same price, but some were luxury like and some were just simply sail boats. And the one leaving the day I wanted to leave? The sail boat. 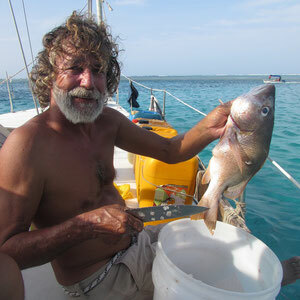 I hesitated, then the women at Blue sailing told me about the Captain, Hernando. 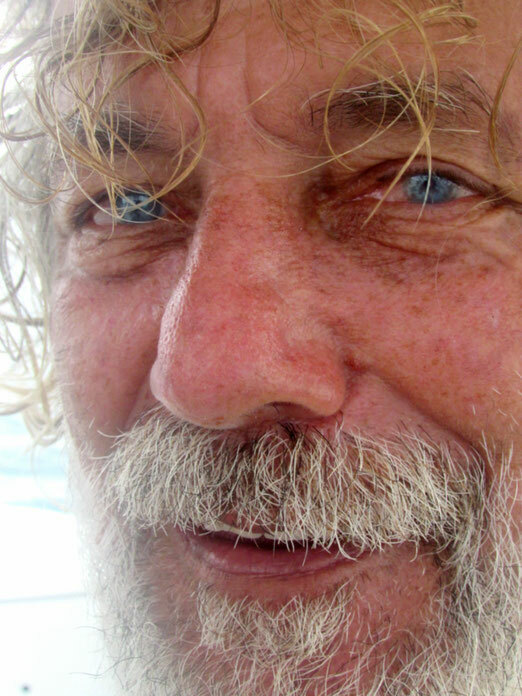 He was the first captain to ever make the trip from Cartagena to Panama and was considered a legend in the sailing world. If I wanted the true, authentic sailing experience, this was going to be it. There were 9 of us, the captain and a cook. So 11 people, on a boat realistically made for 4. Our beds were half the size of our bodies and there was one toilet. No shower. Let the adventures begin! Colombia to Panama, on a sailboat, with only the stars and ocean for the next 6 days! We left Cartagena, after visiting immigration, around 8pm. I woke up a few hours later to crashing waves and sounds of pots and pans falling on the floor. I wobbled my way up to the deck to see what everyone was up too. It looked like a scene from an A&E waiting room. 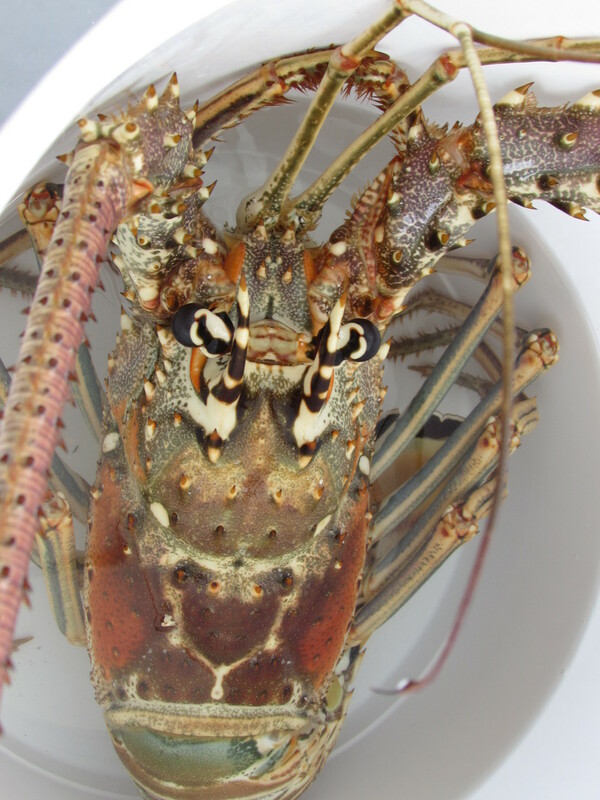 9 bodies curled up over each others, head over the sides, depositing of that dinner I missed. It went a little something like that for the next 36 hours. Every now and then someone would try and make the journey downstairs, or Danni the cook would try and get together some food, both ending with a crash and a sigh. I didn’t eat for that whole time; neither did most of the rest. All we could do was sleep, and try and stay in one place. Not even the sight of dolphins riding along with us in the morning could provoke anything more than a smile. There were times during the journey I felt like I was finally ready to go home, after 7 months on the road. I was missing comforts and was fed up of either being ill or uncomfortable. It didn’t help that I still felt ready to collapse at any moment. I didn’t know whether it was my illness, the motion of the ocean, the lack of food or the sweltering heat, but those feelings were the first I had had through my whole trip, and probably the lowest I had felt too. I retreated into a ball of stillness and tried to sleep away the illness and negative thoughts. A few miserable hours later, like out of a dream, the waves calmed, the boat slowed and palm tress appeared. 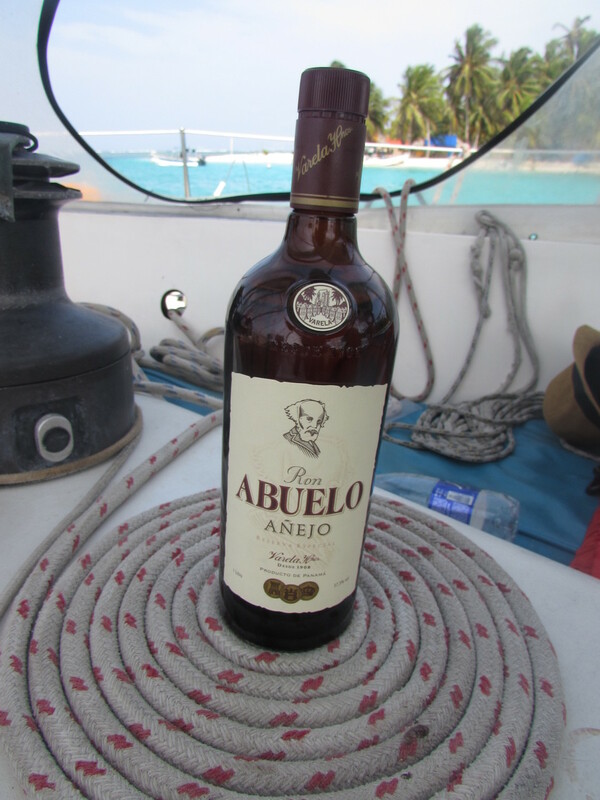 After 36 hours on the open ocean we had arrived on the postcard islands of San Blas, and to the first touch of water for over 2 days. I didn’t even notice how crystal clear the water was, or how heavenly the island looked. I just wanted to jump in. 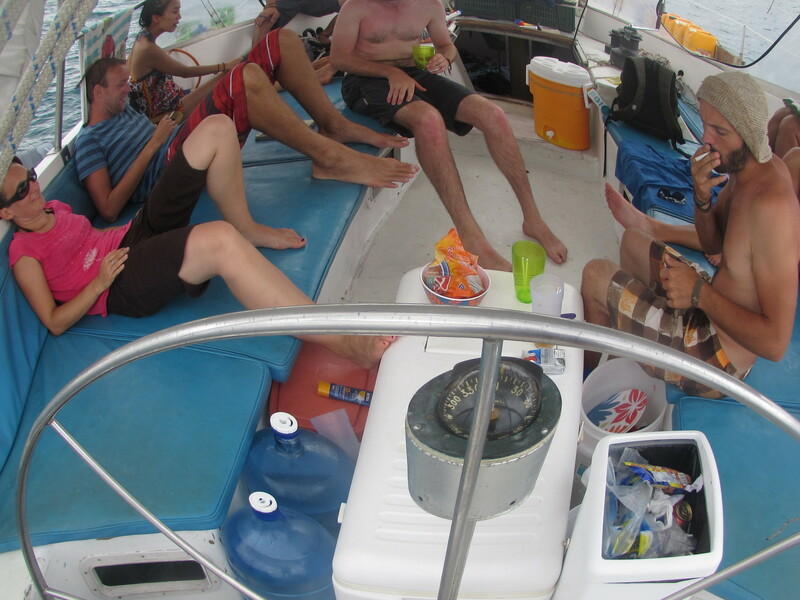 My body was craving water after being stuck on a small boat with sick people for 2 days. Coming up from the dive, I finally saw the beauty that lay before us. 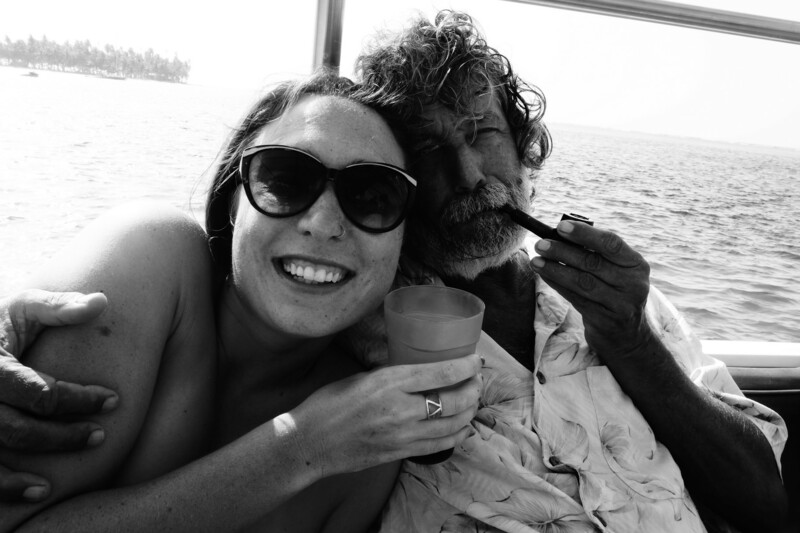 We had anchored up on one of San Blas’ 365 islands, and this one was inhabited. 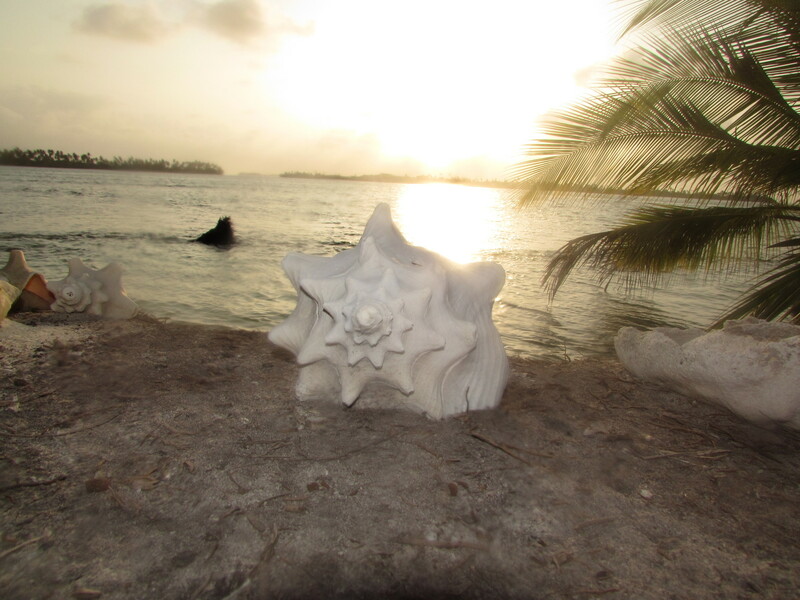 Just the coconuts, the star fish and us. 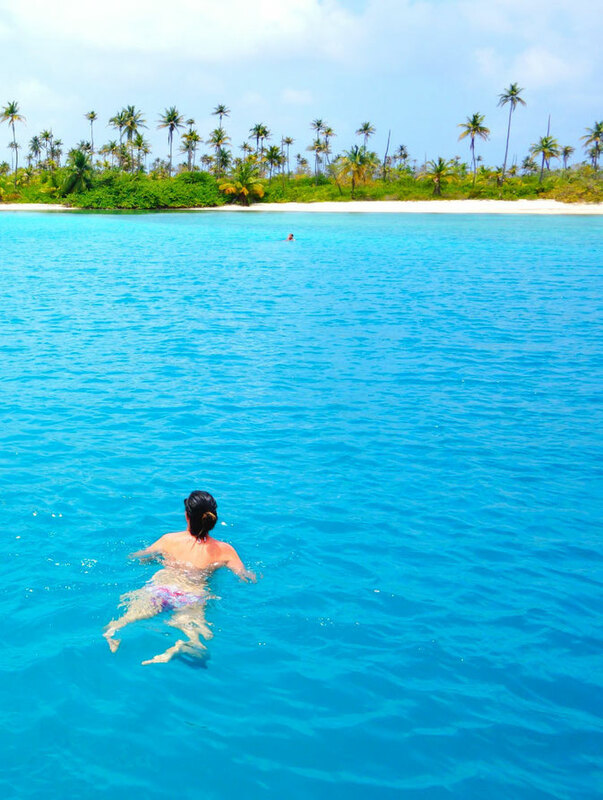 We swam from the boat to the island, which in itself was incredible ( LOOK at that photo) I felt like I was in someone’s dream, not my own, it felt too good to be true, and hadn’t I just been in the worst mood possible?? We walked around the whole island-twice, until the sun started to set and our stomachs started to rumble. 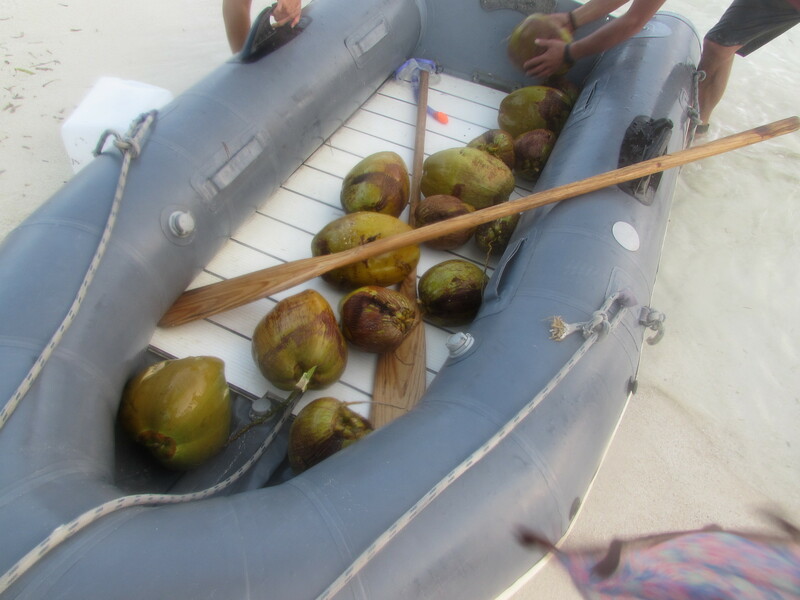 Becoming real ‘survivors’ we ( I say we, I mean the men) climbed the coconut trees and picked 11 of the biggest coconuts it had produced, bundled them into a dingy and rowed them back to the boat. On the boat we cracked open the coconuts, poured in some (a lot) of rum and laughed our way through the most untouched sunset. Life was perfect, so unbelievably perfect. 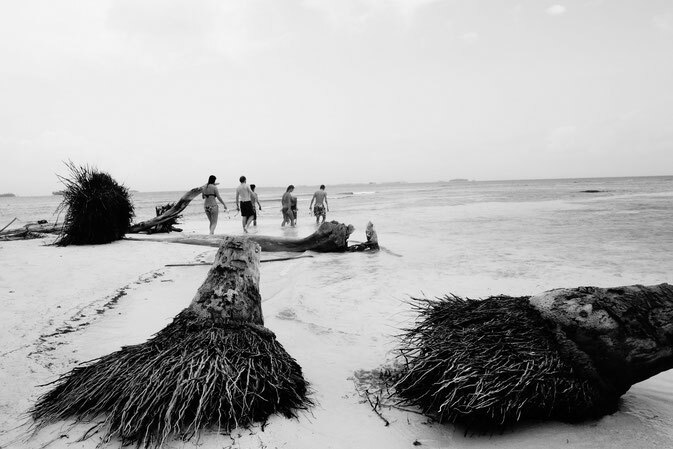 The next morning we moved on to a larger island where we discovered we were not alone and that other paradise seekers had found it and pitched up tents. In protest we stayed on the boat and ate freshly caught lobster, crab and octopus, which was quite possibly the best seafood you could ever imagine possible. 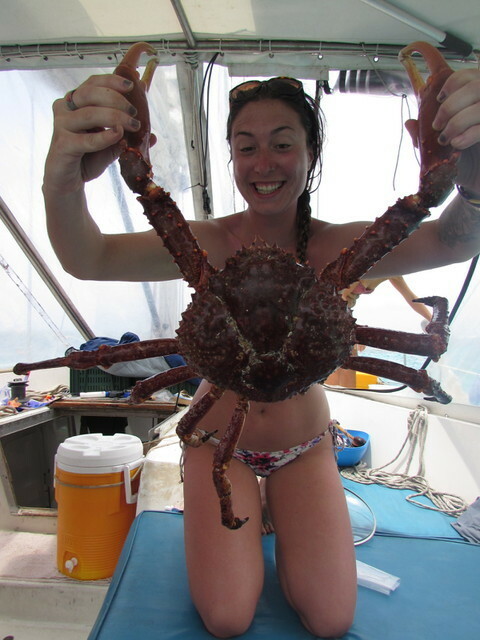 We snorkelled out to the reef and let the current take us where it wanted, and when we got tired we retreated back to the boat for more rum. Life was so simple and so stunning onboard the ‘Victory’ memories of illness, thoughts of going home and rough seas were washed away with the sea air. 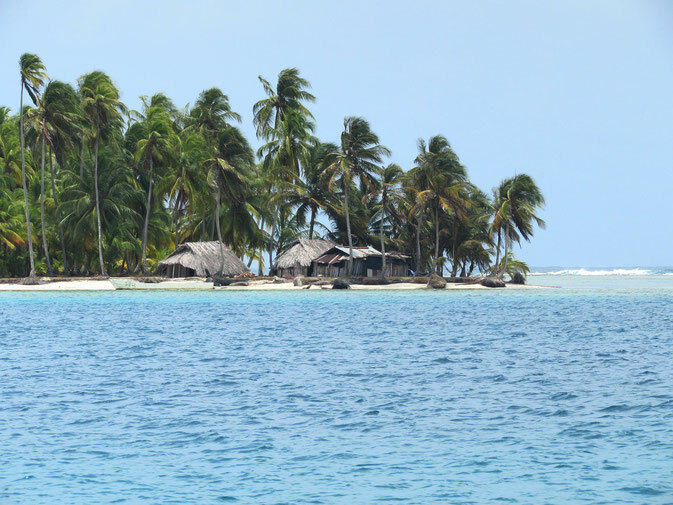 In total we spent 2 and ½ days in San Blas, in a blur of coco locos, sunsets and sandy feet. To be honest there’s not much more I can say about staying on San Blas islands without sounding like a sickening holidaymaker having found there slice of paradise (actually I already sound like that) But trust me when I say it was PERFECTION. 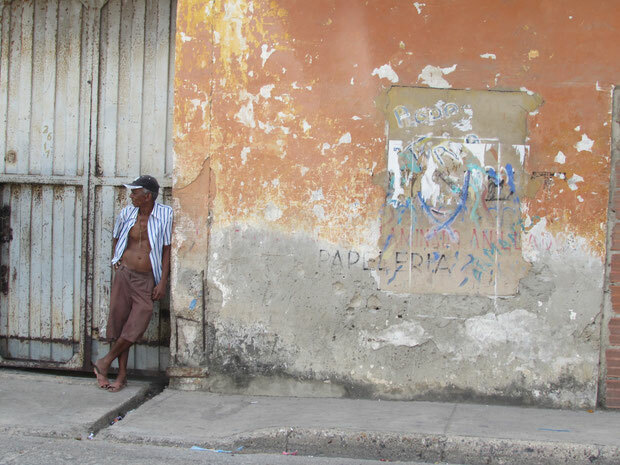 Arriving in Portobello, Panama a wash of emotion overcame me. I went from being sick and wanting to go home, to in absolute paradise, with the most positive mindset. I really felt like I had gone through a journey, and honestly I felt like an adventurer. Roads are being built between Colombia and Panama which means sooner or later these boats wont be in demand. It is also illegal to sail across borders and is only allowed through generous brides by captains, so I was well aware of how lucky I was to have made the journey and had the opportunity. We sat on the boat in the harbour for longer than we needed too. No one wanted to leave, even though we hadn’t showered, slept or looked in the mirror for 6 days, the simple life was too hard to leave behind. Eventually saying our goodbyes to the Capitain and Dani we all headed on to Panama city together, to celebrate survival, have a long shower, and spend one last night as a group. This experience (and that it defiantly was) is so hard to put into words, I can safely say I have never experienced such highs and lows in such a short period of time, nor had my eyes seen such beauty and such powerful nature. I find myself with a new respect for the ocean, a new outlook on travel and even more enthusiasm for life than before. Never did I think a journey on a boat could do that for me, honestly I just thought it sounded like an awesome thing to do, I massively under estimated it. It was much more than just a journey. No electronics except from camera. Should I bring Booze: YES. We had an amazing captain, who was very generous with his rum, but I’ve heard we were just lucky, bring a bottle and some beers.. the islands provide the coconuts. And the question everybody asks me: Was it worth it? Without a doubt. The most unbelievable experience I think I will ever have. Do not even consider not doing it. Oh and I made the right decision with the sail boat, the Victory and Hernando were the best couple you could ever meet. ‘Cappy’ as he was known as, truly is the legend he is portrayed to be.. but he has to be met to be believed, long let the legend rein. 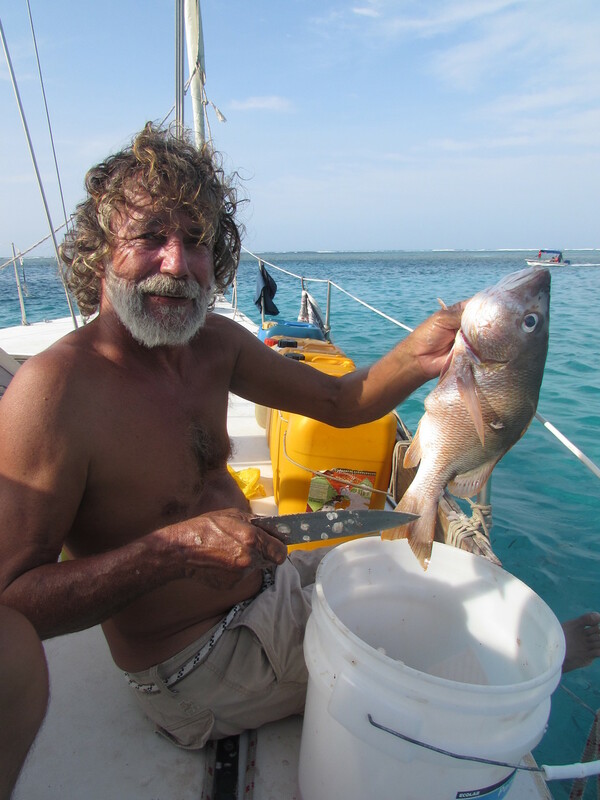 Best captain for Columbia to Panama adventure! Ive never met anyone else who has taken this journey..Let me know if you have and what your experience was.. It sounds like quite an adventure. If I ever need to get from Colombia to Panama now I know how. Thanks for sharing the good and the bad. Wow what a journey! Sounds like an amazing experience, even if it didn't seem so great to start with. Thanks Jerome, it ceertainly was the adventure!! Thanks for the Tweets! And Emma, yeah it didnt start of too great, but looking back now it really is one of the best things ive ever done. Yes he has a Facebook page that you can message him on!! You wont regret going with him. Wish i could do it all over again. All Pics are really nice. thanks for sharing. well organized way of sharing. thank you nice admin. thank you for sharing the great article and I am feeling happy to see your site. keep it up! Sounds awsome, I am really keen to go from Panama to Colombia. How did you get your main pack across if you say to only take 1 spare set of clothes? 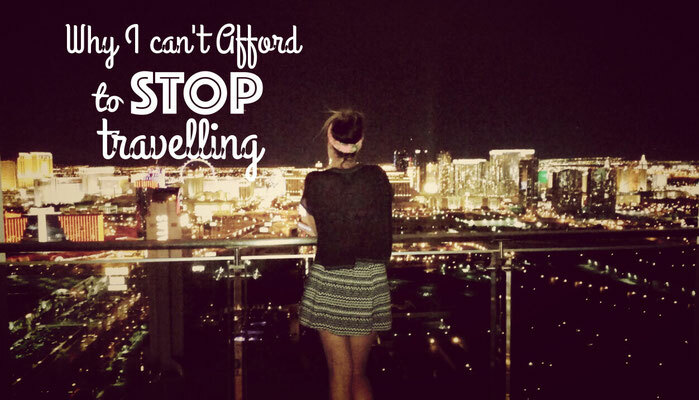 Oh my god, I just found the best travel blog. I want to tell you that I enjoyed reading it. great work with your blog and I really admire your life style! 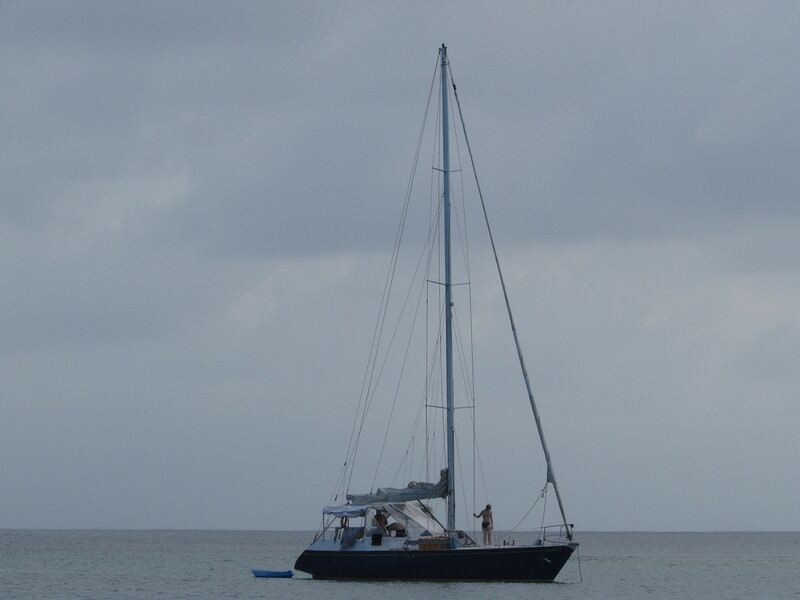 Your experience with the sailing boat sounds like you truly had a once-in-a-lifetime adventure! 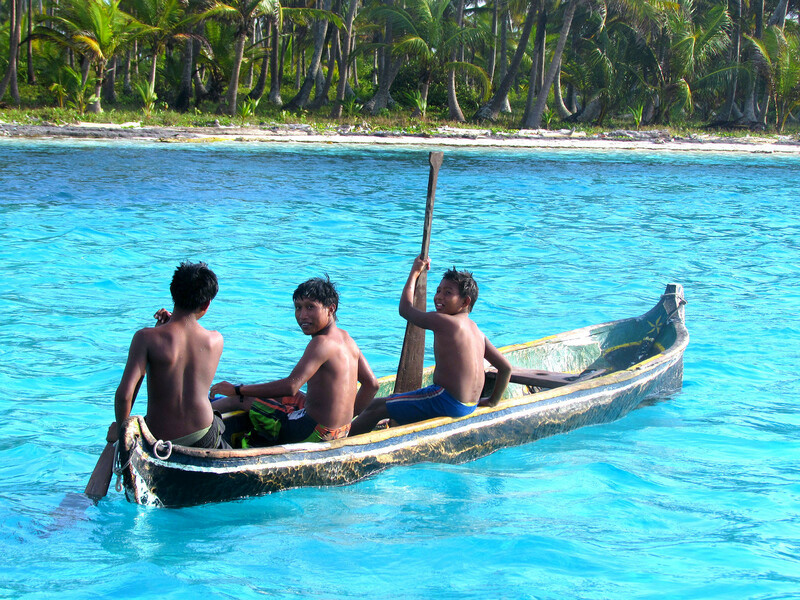 And yes, seeing the San Blas islands for the first time and the crystal-clear water makes up for everything! But, unfortunately since you have done the trip a lot of things have changed. 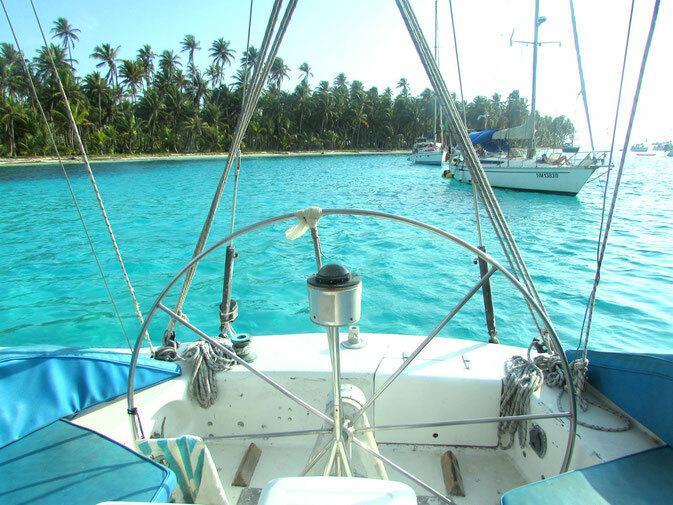 Sailing is currently very critical as foreigners are not allowed to work or conduct tourism in San Blas - and unfortunately basically all sailing boats are run and operated by foreigners (= Non-Kuna people). 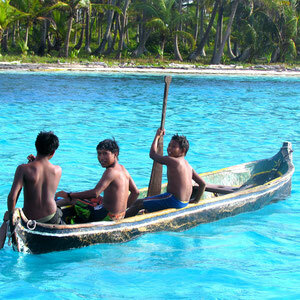 One alternative is to get to know the San Blas islands via a speed boat trip. 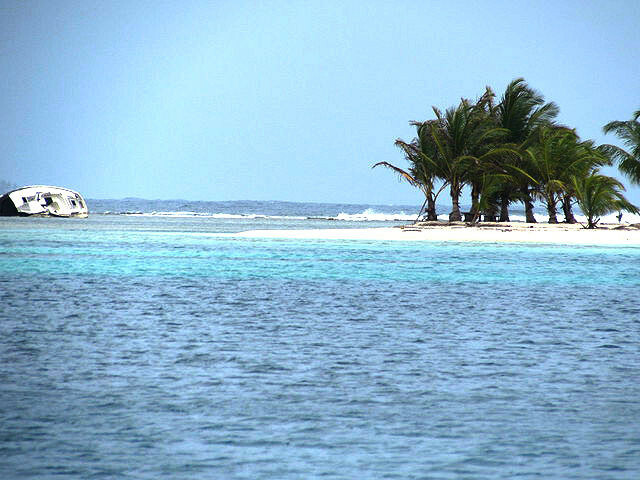 The trip starts in Sapzurro, Colombia (you can get there by bus from Cartagena and get to know Capurgana, one of the secrets of Colombia) and then takes you in a few days through the San Blas islands. 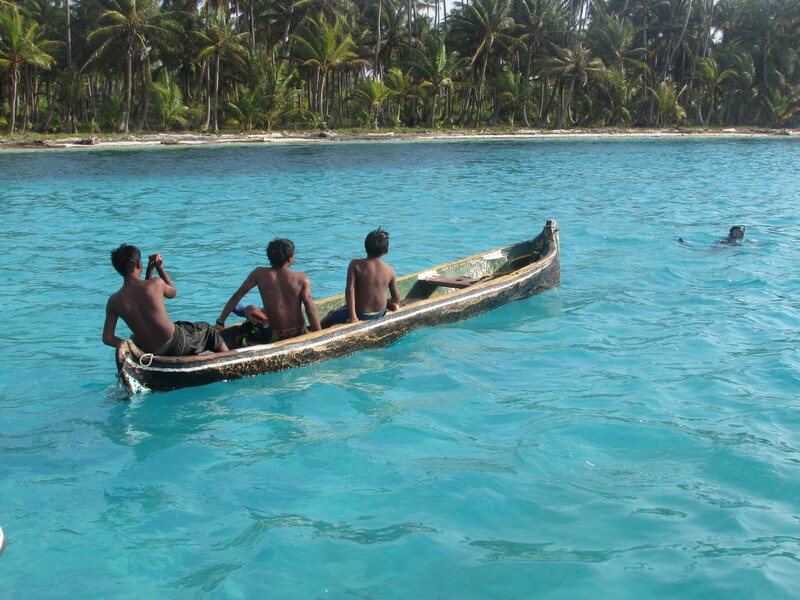 You will actually sleep on the islands in traditional Kuna huts and have traditional, delicious meals there. No open sea crossing, no sea sickness. 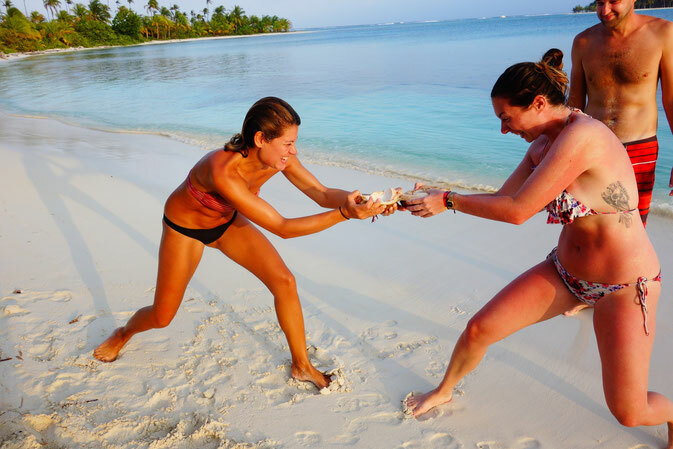 My own company, San Blas Frontera, offers multiple-day island hopping trips through the San Blas islands in small groups, at an advantageous price and with a local, authentic promise. 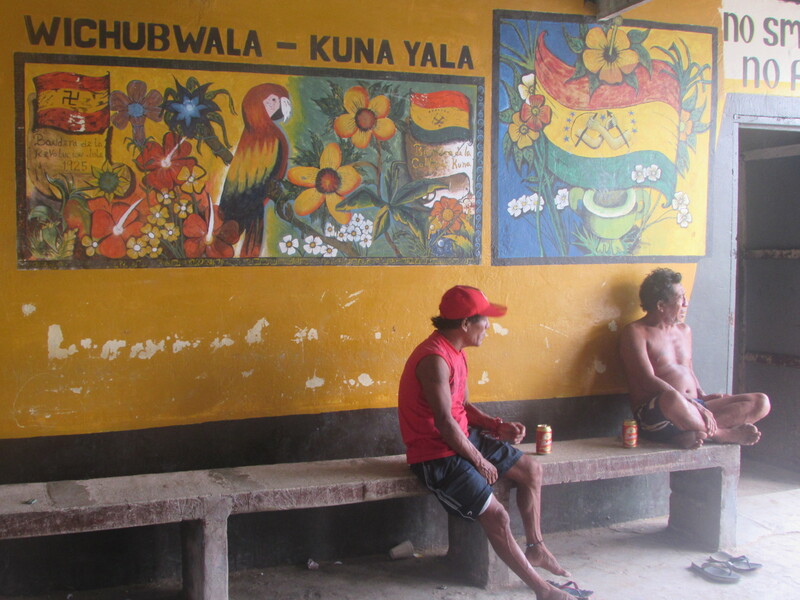 Contrary to other companies, we are a pure Kuna company – everyone in our company is from the San Blas islands. We grew up here with our traditions and our heritage and we work closely with our communities. 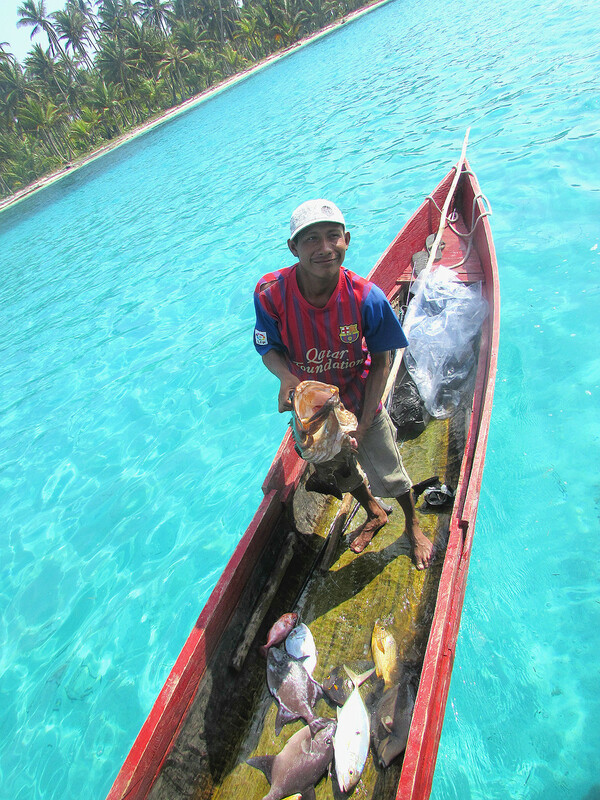 As such, not a single Dollar of the price paid for the trip leaves San Blas but stays in San Blas. Having travelled myself numerous times across the globe, I wish to provide my guests an affordable and authentic option to get to know my culture and my home country. 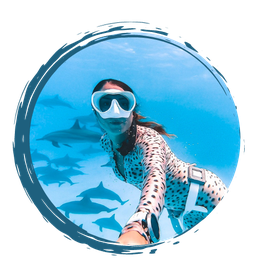 We believe in the magic of travelling in small groups which will give you the chance to explore the islands in a more peaceful and less commercialized way and in the flexibility to customize your trip to your liking. Our most popular trip is for three days but we are fully flexible on extending the stay by arriving a bit earlier or by spending additional days in a Kuna village close to the Colombian border. 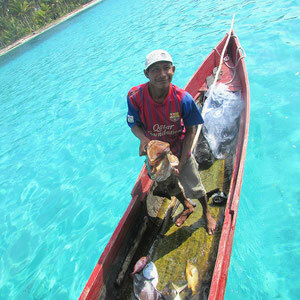 Get in touch with me if you wish to know more about this trip or the San Blas islands!